The Da Vinci Code. Misquoting Jesus. The Jesus Papers. The Gospel of Judas. New portraits of Jesus continue to stir up interest and debate. The more unusual the portrait, the more it departs from the traditional view of Jesus, and the more attention it receives in the popular media. Critical study of the Gospels has often shed light on the Jesus of history - but has also distorted the Gospels and rendered Jesus unrecognisable. Why are some scholars so prone to fabricate a new Jesus? What methods and assumptions predispose them to distort the record? Why is the public so eager to accept such claims without question? Is there a more sober approach to finding the real Jesus? Craig Evans offers insights into the methods and biases of modern interpreters, whether scholars associated with the Jesus Seminar or popularisers like Michael Baigent and Dan Brown. He examines how we got today's New Testament text, how ancient historians did their work, what second-century Gnosticism was all about, and the way first-century Jewish and Greek culture informs scholarly study of the Gospels. Readers will come away with a new appreciation of the value and limits of contemporary biblical research. Modern historical study of the Gospels seems to give us a new portrait of Jesus every spring--just in time for Easter. The more unusual the portrait, the more it departs from the traditional view of Jesus, the more attention it gets in the popular media. 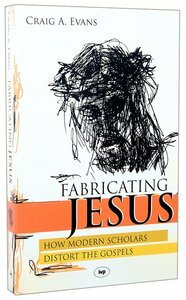 Why are scholars so prone to fabricate a new Jesus? Why is the public so eager to accept such claims without question? What methods and assumptions predispose scholars to distort the record? Is there a more sober approach to finding the real Jesus? Commenting on such recent releases as Bart Ehrman'sMisquoting Jesus, James Tabor's The Jesus Dynasty, Michael Baigent's The Jesus Papers and the Gospel of Judas, for which he served as an advisory board member to the National Geographic Society, Craig Evans offers a sane approach to examining the sources for understanding the historical Jesus. Craig A. Evans (Ph.D., Claremont) is Payzant Distinguished Professor of New Testament and director of the graduate program at Acadia Divinity College in Wolfville, Nova Scotia. He has written extensively on the historical Jesus and the Jewish background of the New Testament era. His books include Jesus and His Contemporaries: Comparative Studies, Luke (New International Bible Commentary), Mark (Word Biblical Commentary), Jesus and the Ossuaries, Fabricating Jesus and Ancient Texts for New Testament Studies. His edited volumes include (with Bruce Chilton) Studying the Historical Jesus: Evaluations of the State of Current Research, Dictionary of New Testament Background, From Prophecy To Testament and (with John Collins) Christian Beginnings and the Dead Sea Scrolls.